Double Glazed Windows for Conservation Areas. Building in conservation areas can be tricky especially considering that the historic or special architectural interests must be preserved or enhanced. However, the most important thing to note is that this does not restrict you from replacing your old windows or installing double glazed windows that are capable of matching the character of the area and the building. Double glazing has an advantage in that it can be made in such a way that it will look exactly like the original windows in the building but this should be done in consultation with the local conservation officer. This having been said, it is important to point out that double glazing comes with a number of advantages which you can enjoy especially if they are installed properly and professionally. 1. Low energy bills: – As aforementioned, double glazing provides your building with quality insulation which helps reduce the level heat loss to the outside space. Installing these windows can help reduce your monthly energy bills or even help you save on the total amount of energy used especially if you are using solar power. Although the monthly savings might not be too much, the accumulated savings could reach thousands of sterling pounds each year. 2. Double glazing windows are environment friendly: – As you use less fuel for heating your home, you will be reducing the amount of carbon dioxide emitted into the environment. This in return helps in the reduction of global warming effects. 3. Enhanced comfort in the home: – As the windows help in reducing hear loss, your building will have fewer cold spots and draughts. 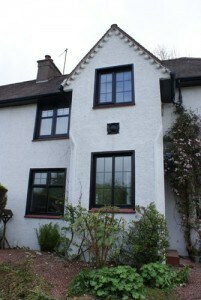 Double Glazed Windows for Conservation Areas. This in return means that you can enjoy improved levels of comfort especially during the cold seasons. 4. Reduces condensation: – Using double glazed windows in your building helps reduce the amount of droplets that form on the warm surface due to moisture. As these droplets accumulate, they turn into frost as they freeze thus making the building feel colder. This normally results to heat adjustment to try and warm the indoor air for comfortable stay. Double glazing helps block the moisture during the cold seasons thus preventing condensation. 5. Enhances safety: – Double glazed windows provide an extra layer of safety since they are tough and thus hard to break compared to single pane windows. It is therefore acceptable to say that they make a building much safer especially because they have a tighter seal compared to other windows. Forcing these windows to open from outside is harder. 6. Provide superior sound insulation: – These windows can help improve sound insulation since they add an extra barrier between the outside environment and the home. You can ensure that all the installation regulations are adhered to by getting a free home survey from experts from The Advanced Group. This will help you know the rules related to the installation while helping you prepare for the project. Double Glazed Windows for Conservation Areas. Give us a call at The Advanced Group today on FREEPHONE 0500 338 488 to find out more and to get a FREE consultation with a helpful member of our team. Or Simply complete the enquiry form on this page.